State of Hockey: #1 vs #2 This Weekend in Duluth? With the Bulldogs the fifth wheel in this year's North Star College Hockey Cup tournament, the games against instate teams brings more meaning as to the state of college hockey in the State of Hockey. 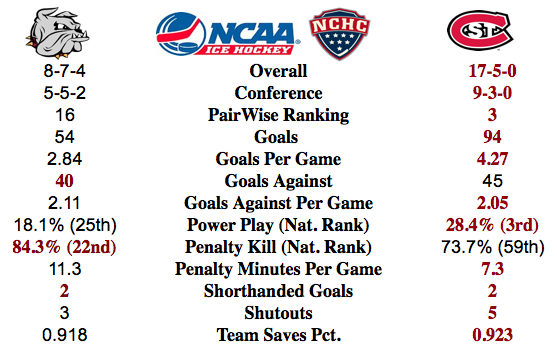 Without a doubt, I think that is safe to say, the Huskies of SCSU are the best currently in Minnesota. Number two leaves some room for discussion, but it is quite safe to say that Minnesota State Mankato and Minnesota Duluth are the two vying for that spot. For arguments sake, MSUM swept the Beavers of BSU while UMD has lost their only game played with a rematch coming in early February. The Bulldogs swept UMTC Gophers convincingly while MSUM was shutout and pulled out an improbable win in the closing minutes and OT against the Gophers. MSUM is at the top of the New WCHA and UMD is struggling in the middle of the NCHC. Luckily for fans, UMTC and BSU face off in the opening round of the NSCHC coming up at the end of January. What to Expect in Duluth: my take. To say you know what UMD is about, what their blocks have stemmed from, this season is a game only fools and charlatans should take on. The Bulldogs have been as much of an enigma and roller coaster as ever, all wrapped into one. Defense seems to be the closest to a constant that one can make out for UMD. Other than that you sit back and take it in. Like the Vikings, UMD has not fared well against the upper echelon ("tournament bound") teams this year. Yet another week to see if this thing can be turned around in time. My prognostication? Who the heck knows! It could be a sweep, in either team's favor. That would be interesting if UMD could sweep or backbreaking if swept. Split would be good for UMD, but not a likely scenario. I pick a SCSU win Friday followed by a tie. During last Friday's night game against the Redhawks many Bulldog fan were probably wondering if the Bulldogs would ever score a goal again. Thankfully Tony Cameranesi was able to get a late 3rd period goal and extend the game with a overtime tie. Now it would have been great to get the extra 3 on 3 overtime point, but the one point was greatly needed for the standings and the pairwise rankings. The tie and the win pushed the Bulldogs up to #16 in the Pair Wise rankings. Hopefully the can ride this momentum and continue the push for Bulldog hockey games in March and April. PWR#3 St. Cloud State @ #16 Minnesota Duluth: Last weekends biggest NCHC surprise was the Huskies loss to the Tigers. This came after the loss to the Under 18 Team the weekend before that at the National Sport Center. What does that mean for the Huskies this weekend? I am not convinced that the Bulldogs can score, especially at home. I am going to pick a Huskies rebound and a sweep. PWR#7 Nebraska Omaha @ #2 North Dakota: The Mavericks lost for the first and second time at the Baxter Arena last weekend and the Fighting Hawks beat the Under 18 Team. I think Dean Blais will have the Mavericks ready and motivated earning a split in Grand Forks. PWR#27 Western Michigan @ #14 Denver: The Pioneers earned a huge sweep in Omaha and now are at home hosting the Broncos. The Broncos are brutal on the road but have historically played the Pioneers well. Something has got to give. I will go with a home sweep by the Pioneers. PWR#20 Bowling Green @ #32 Miami: The Falcons are traveling to Oxford to play one game against the Redhawks. The Falcons have played well on the road and the Redhawks are having a down season. This should be a Falcons win. Games in October - December aren't that important said one college hockey analyst. The UMD Bulldogs are looking to see if it can possibly be true. A run is in order for UMD to make it from #25 in the PWR now to the area of being in the mix for the 16 in the tourney. No better place to start (again) than at Miami...this weekend...now. Why the interjection of "again" in that last sentence? UMD has been here already...this season...going to Colorado College. At that time UMD reeled off four wins in row before hitting the buzz saw that is North Dakota. Picks by @afiskness. After the holiday break the Bulldogs are back to action traveling to Oxford, Ohio to take on the Redhawks. The first half of the season was very average with the Bulldogs having a 7-7-3 record and definitely not playing up to the preseason expectations. The bulldogs will need a strong second half to play their way into the NCAA playoffs. 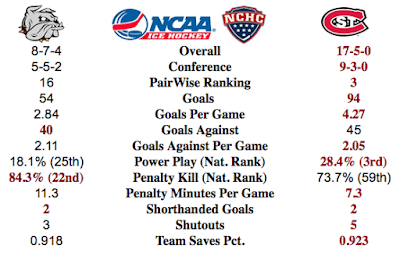 PWR #25 Minnesota Duluth @ #27T Miami: Neither team is playing great or up to expectations. The Bulldogs generally play better on the road then at home. I give the edge to the Bulldogs but until they prove that they can consistently score I will pick a split. #57 Colorado College @ #3 St Cloud State: One this the Huskies have done well this year is to score goals. I don't see the Tigers hanging with the Huskies this weekend, Huskies sweep. #18T Denver @ #2 Nebraska Omaha: The new Baxter Arena has been kind to the Mavericks and I think that will continue. I am going with the Mavericks home sweep. #27T Western Michigan vs. #13 Notre Dame (home/home): The Broncos are bad on the road and play much better at home. But this weekend I think the Fighting Irish will be able to pull off a sweep.